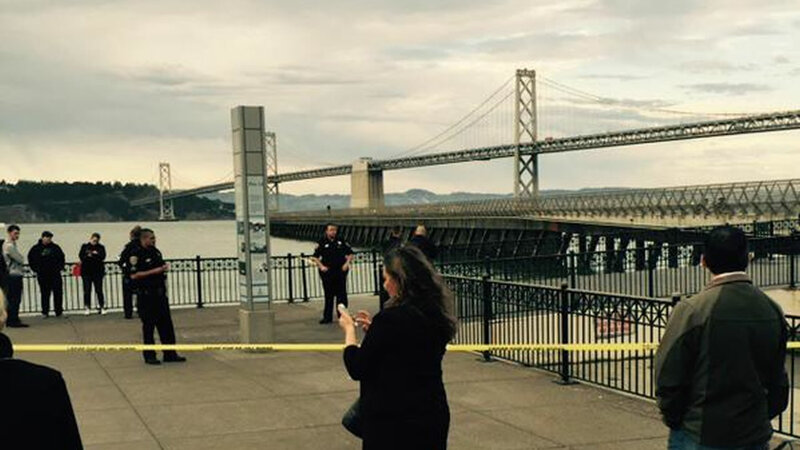 SAN FRANCISCO (KGO) -- A woman was shot and killed on Pier 14 next to the Ferry Building in San Francisco Wednesday night. The location is one of the city's most scenic tourist spots and it is very rare for a shooting to happen in that area along the Embarcadero. San Francisco police say the 31-year-old Pleasanton woman was walking along Pier 14 when a man came up and shot her in the upper torso. Someone shot video from a 15th floor apartment after the photographer heard a single gunshot. You can see several bystanders trying to help the woman after she was shot. Detectives say they're not sure what the suspect's motivation was and police may have that suspect in custody. Within an hour after the shooting, police detained a person of interest at Pier 40, just north of AT&T Park and took him in for questioning. A person claiming to be a friend of the victim told ABC7 News, the victim was with her father, enjoying the view when she was shot. An ambulance rushed her to San Francisco General Hospital where she was pronounced dead around 8:30 p.m.
San Francisco police Officer Carlos Manfredi told the media, "We're asking anyone, any member of the public, if they captured this on their cellphone, if they witnessed any of this, to please come forward and contact SFPD." There were at least 20 people on and around Pier 14 when the shooting happened, so police should have some detailed information to work with. Anyone with information is encouraged to contact the SFPD Anonymous Tip Line at (415) 575-4444 or text a tip to TIP411 with SFPD at the beginning of the message.